Today, July 8, we celebrate the feast day of Saint Priscilla and St. Aquila(first century),disciples and friends of Saint Paul. 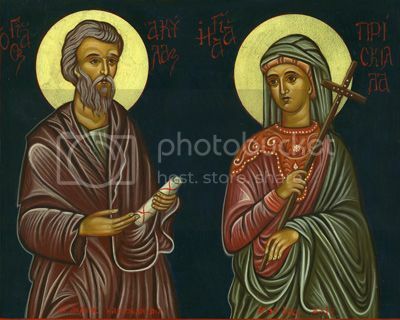 Priscilla and Aquila were a Jewish couple who had been exiled to Corinth, and hosted Saint Paul on his visit to that city. Likely converted by Saint Paul, they are later mentioned in the New Testament several times as “co-workers in Christ” and went on to preach and evangelize throughout the region. Holy legend tells us that Saint Priscilla was martyred by an angry mob at the end of her holy life. 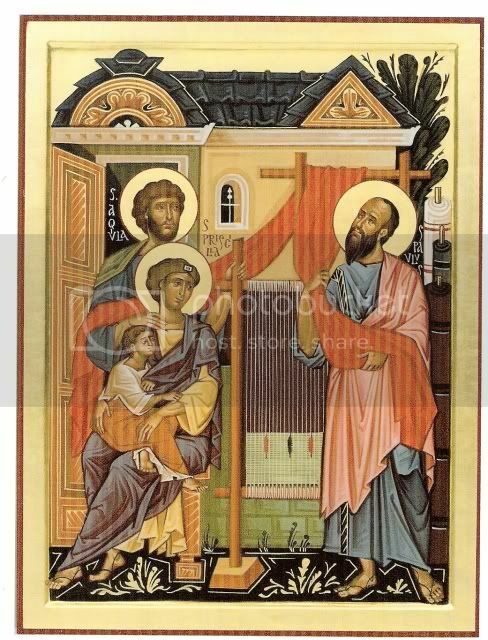 Saints Priscilla and Aquila were tentmakers, sharing the same profession as Saint Paul, which is likely why he stayed with them. Priscilla and Aquila had likely been exiled from Rome by the order of Emperor Claudius who forbade Jews to live within the city walls. Following his time in Corinth, we learn in Acts of the Apostles that the holy couple—who Paul likely converted—accompanied him to Ephesus and worked alongside him for three years. It was in their home that Mass was likely celebrated. 1 After this, Paul left Athens and went to Corinth. 2 There he met a Jew named Aquila, a native of Pontus, who had recently come from Italy with his wife Priscilla, because Claudius had ordered all Jews to leave Rome. Paul went to see them, 3 and because he was a tentmaker as they were, he stayed and worked with them. Upon Saint Paul’s departure, Aquila and Priscilla stayed behind, where they continued the work of the Lord. 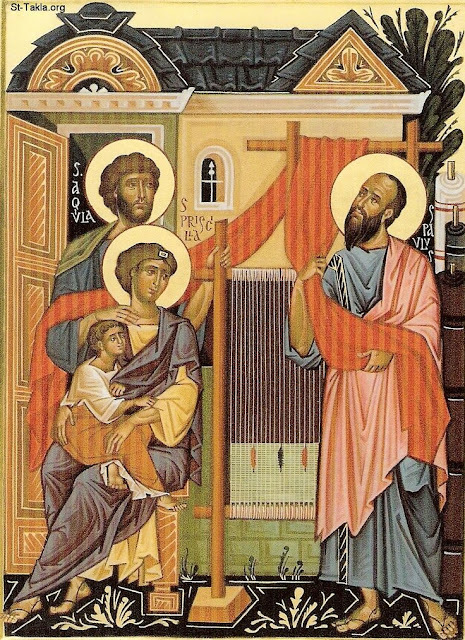 Saints Priscilla and Aquila, as evident in the writings of Saint Paul, later met up with Paul in Rome, where they were likely martyred around the same time as Saint Paul. Catacombs in Rome are named for Saint Priscilla, where many holy men and women are buried. It is interesting to note that Aquila and Priscilla are mentioned six times throughout the New Testament, and in half of those references, Aquila is listed first, whereas in the other half, Priscilla is mentioned first. This is likely indicative of Paul’s love of both, and his consideration of their being on equal terms in ministry and the eyes of the Lord. It is clear from the descriptions of this holy couple that Saint Priscilla was an effective teacher and evangelist without usurping or undermining her husband's ecclesial authority. God of grace and might, we praise thee for thy servants Priscilla and Aquila, whom thou didst plenteously endow with gifts of zeal and eloquence to make known the truth of the Gospel. Raise up, we pray thee, in every country, heralds and evangelists of thy kingdom, that the world may know the immeasurable riches of our Savior, Jesus Christ our Lord, who liveth and reigneth with thee and the Holy Spirit, one God, now and for ever. Amen.